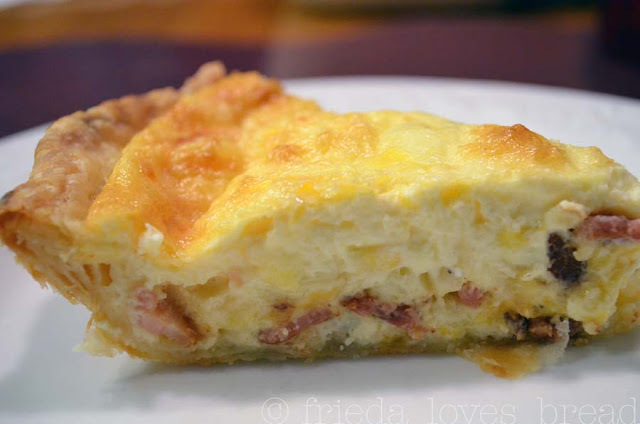 In my last neighborhood, Sherrie would make a quiche for all the neighbors as her Christmas gift. It came baked, wrapped in foil, ready to warm up and eat for Christmas morning. Sherrie made this quiche simple, to appeal to all tastes in any family. It has cheddar, Swiss, bacon and onion powder for the finicky onion eaters. You can change it up to add mushrooms, spinach and any other ingredients that would sound good. She suggests using Gryure and Emmentaler cheeses, although cheddar and Swiss are good substitutes. I have a new favorite pie crust, from Cook's Illustrated, and yes, it includes vodka. It is odorless, tasteless, and the folks from ATK say it evaporates when baked, leaving a flaky pie crust behind. You can use this other recipe, Perfect Pie Crust 101, which uses Crisco shortening, a food processor and has worked well for me for many years. You can use a store-bought pie crust... I won't tell, so go ahead! 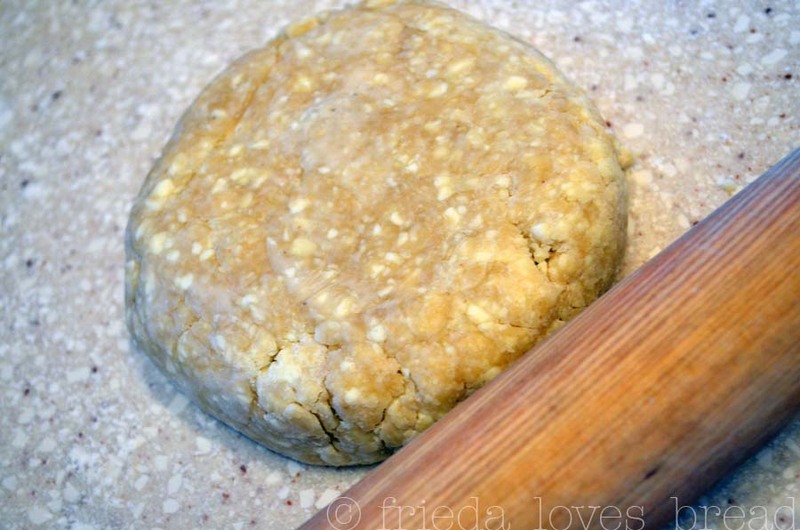 The pie crust is blind baked for 8 minutes to prevent a soggy crust. The cheeses are shredded and tossed with 1 T. of all purpose flour. This keeps the cheeses separated, allowing for an even distribution throughout the quiche. This is also called "par-baked." I like to cut the bacon with my kitchen scissors, then fry them in a skillet. Drain, toss with the floured cheese, and put into your par-baked crust. 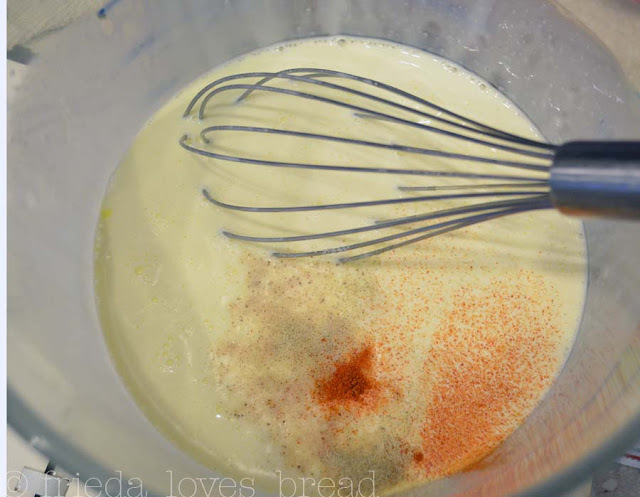 Heavy cream (whipping) is whisked together with milk, eggs, salt, white pepper, and a touch of cayenne. Using a strip of aluminum foil during the last 10-15 min of baking will prevent the crust from over browning, a tip I learned from a professional pie baker. A slice of this reheats well in the microwave and still retains a crispy crust. What a fantastic dish to wake up to Christmas morning, Easter morning, or any special occasion! 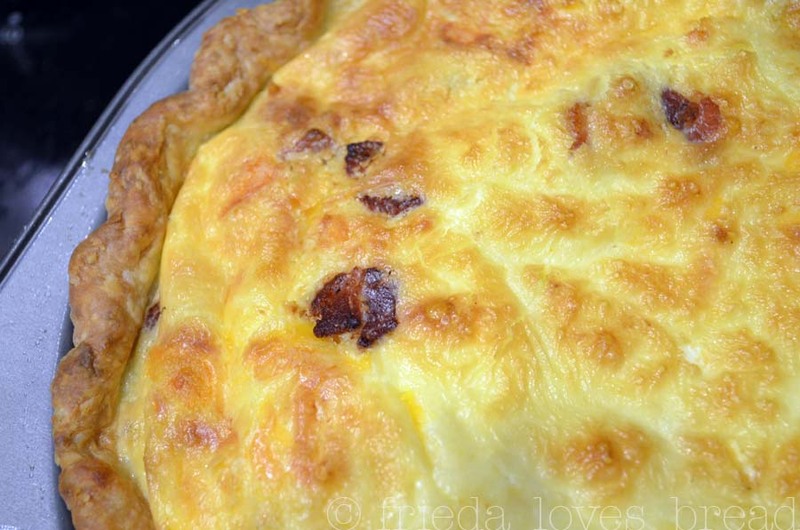 Ultra decadent, creamy quiche that is sure to impress! You can change it up to add mushrooms, spinach or diced ham. 1. Blind bake the pie crust by lining it with foil or parchment paper and filling it with dry beans or pie weights. Put in a 450°F oven for 8 minutes.2. Remove pie crust from oven and turn down the oven temperature to 375°F.3. 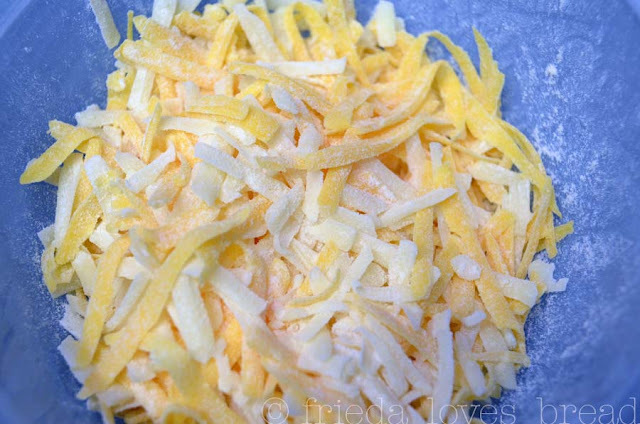 In a medium bowl, toss both shredded cheeses with the flour.4. Add cooked/drained bacon pieces with the cheese. Toss to coat. 5. 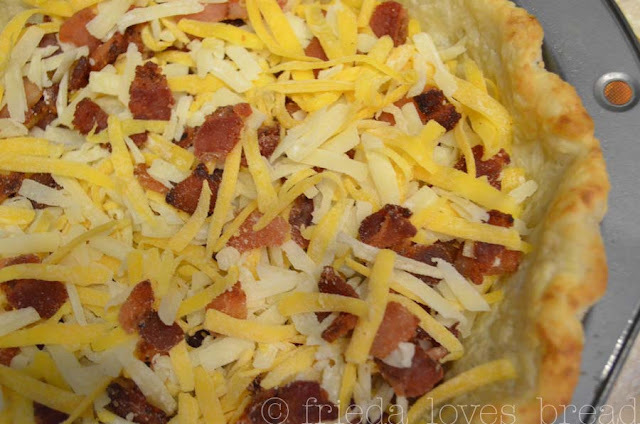 Put bacon/cheese mixture in par-baked pie shell.6. In a separate bowl, whisk together heavy cream, milk, eggs, onion powder, salt, pepper and cayenne. Slowly pour egg mixture over bacon/cheese.7. Bake in a 375°F oven for 35-40 minutes or till puffy and golden brown. Place strips of aluminum foil around the pie crust during the last 10-15 minutes to prevent over-browning the crust.8. Remove from oven and place pie on a wire cooling rack.9. Serve, or completely cool, cover with foil, and refrigerate to enjoy later or to give away as gifts.10. To reheat, cut a slice and reheat in the microwave for 1-2 minutes on high power. NOTE: Can use 1 small onion, chopped and sautéed in 2 Tablespoons of reserved bacon drippings. Add in sliced mushrooms, or chopped/drained spinach, if desired. Wow. I want that neighbor!! Great idea. Im trying her recipe. thanks! Stunning! My ALL time favorite quiche and what a lovely gift to receive on Christmas Morning....breakfast all ready to go! I LOVE IT!